The Valuation Office (VO) in Dublin has advised that digitised scans of the Griffith's Valuation Revision Books for 17 counties are now available to view on computer screens by personal visitors. The Revision Books, which are also known as the Cancelled Books, contain information on all property in the state from the mid-1850s until the early 1990s. They show changes in land and property ownership since Griffith's Primary Valuation of Ireland, and are used by Irish genealogists to trace their ancestors' homes over that period. It used to be the case that researchers visiting the VO would view and photocopy from the original books. Inevitably, some of the older books were being damaged or becoming worn in this process, so a decision was taken to start digitising them for public viewing and so reduce the wear and tear of the precious originals. A digitisation project by the Public Record Office of Northern Ireland resulted in a free online database of high quality scans of the Revision Books for counties Armagh, Antrim, Down, Fermanagh, Londonderry and Tyrone. It went live back in March 2013 and can be viewed and searched here). In comparison, a similar project in the Republic has been wading through treacle. 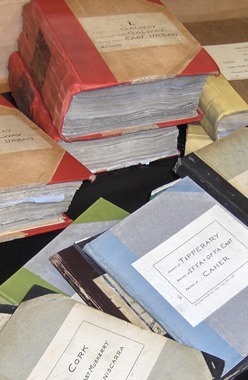 At the start of 2014, Irish Genealogy News reported that the books of five counties had been digitised and the images were available to search and browse at the VO's premises. By January 2017, the number had gone up to 13, and nearly two years later, we have another four counties, so there has been progress, but it's in slow motion. This is because no additional resources have been directed to the project; existing staff prepare and scan the books as and when they can. The 17 digitised counties are: Carlow, Cavan, Clare, Cork City & County, Donegal, Dublin City & County, Galway, Kerry, Kildare, Limerick City & County, Mayo, Meath, Monaghan, Offaly, Roscommon, Sligo and Tipperary. This leaves the following counties still awaiting digitisation: Kilkenny, Laois, Leitrim, Longford, Louth, Waterford, Westmeath, Wexford and Wicklow. I understand that the books for these outstanding counties have all been scanned and searchable versions will make their way to the public search room computer terminals in due course. As yet, there are no funds and no plans to create an online database.